The LE852 spa is a compliment to the LE850. It is the same size, it has the same features, 52 multi-purpose jets, including our patented, QUAD SPIN ROTO jet that provides a rapid masseuse type of stimulation to areas of the body such as the next, back or legs. 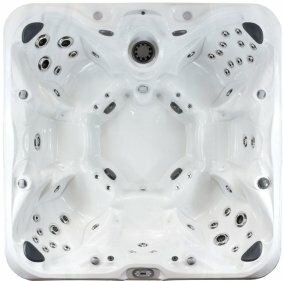 The LE852 is a "sit around" type of hot tub that is popular for entertaining or use with large families. Find your favorite seat and put your name on it.